Over one million abusive or problematic tweets were sent to women last year – an average of one every 30 seconds – Amnesty International revealed recently, in a ground-breaking study into abuse against female politicians and journalists from the UK and US on Twitter. More than 6,500 volunteers from 150 countries took part in Amnesty’s ‘Troll Patrol‘, a crowdsourcing project designed to process large-scale data about online abuse. Troll Patrol volunteers collectively dedicated an incredible 2,500 hours analysing tweets – the equivalent of someone working full-time for 1.5 years, and sorted through 228,000 tweets sent to 778 female politicians and journalists in the UK and USA in 2017. Online abuse against women cut across the political spectrum. Politicians and journalists faced similar levels of online abuse: liberals and conservatives alike, as well as left and right leaning media organisations, were affected. The politicians included in the sample came from across the USA and the UK’s political spectrums, and the journalists were from a diverse range of US and UK publications, including The Daily Mail, The New York Times, The Guardian, The Sun, gal-dem, Pink News and Breitbart. Amnesty said it has repeatedly asked Twitter to publish data regarding the scale and nature of abuse on their platform, but so far the company has failed to do so. This, Amnesty has pointed out, hides the extent of the problem and makes it difficult to design effective solutions. Julien Cornebise, Element AI’s Head of the London office and AI For Good’s Director of Research, said: “This study is part of a long-term partnership between Amnesty and Element AI. Kate Allen, Amnesty UK’s Director, said: “It’s clear that a staggering level of violence and abuse against women exists on Twitter. 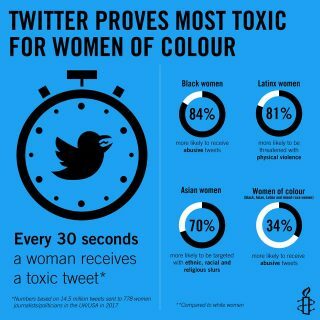 These results back up what women have long been saying – that Twitter is endemic with racism, misogyny and homophobia. As Amnesty has pointed out, abusive content violates Twitter’s own rules and includes tweets that promote violence against or threaten people based on their race, ethnicity, national origin, sexual orientation, gender, gender identity, religious affiliation, age, disability, or serious disease. Problematic content is defined as content that is hurtful or hostile, especially if repeated to an individual on multiple or cumulative occasions, but not as intense as an abusive tweet. Amnesty said it had shared its findings with Twitter. In response, Twitter requested clarification on the definition of “problematic” “in accordance with the need to protect free expression and ensure policies are clearly and narrowly drafted”. Milena Marin, Amnesty International’s Senior Advisor for Tactical Research, said: “Twitter’s failure to crack down on this problem means it is contributing to the silencing of already marginalised voices. “By crowdsourcing research, we were able to build up vital evidence in a fraction of the time it would take one Amnesty researcher, without losing the human judgement which is so essential when looking at context around tweets. “Troll Patrol isn’t about policing Twitter or forcing it to remove content. We are asking it to be more transparent, and we hope that the findings from Troll Patrol will compel it to make that change. To view the findings and commentary on this in detail, click here.